TV dramatist and playwright Dennis Potter was the ultimate Marmite figure – one minute delighting millions with musical plays such as The Singing Detective and Pennies From Heaven, the next causing outrage and controversy with productions such as Blackeyes and Brimstone & Treacle. His mixture of hard-hitting themes (death, religion, sexual fantasy) was married to the mass medium of prime-time terrestrial TV. He was as much fascinated by the thought of his audience sprawled across settees amongst the cups and living room detritus, as he was to the impact and reaction provoked by his work. A doyen of the 60s/70s Play For Today school of drama, his work was designed to make one stop and think as well as be thoroughly entertained in the bargain. In this performance piece Project Adorno present a contemporary interpretation of Potter, the man and his work, through an ambient segue of original songs, samples, spoken word extracts and visuals charting his journey from miner's cottage in the Forest of Dean to international mass media acclaim - and ultimate redemption. A cubist biographical sketch told through live songs, electronic music, original video footage and pre-recorded voice extracts from people who knew or had some connection to Potter and his work. Project Adorno's cubist portrayal of Derek Jarman, capturing his poetic visual imagery, love of super 8 film and enduring creative individualism. Filmmaker, painter, gay rights activist, author, gardener – Derek Jarman packed many roles into a short life. Since his death in 1994, his standing has never been higher. And yet he remains a contradictory figure: a self-effacing exhibitionist, a well-to-do RAF child who embraced the possibilities of punk. For decades, he was a thorn in the establishment’s side and yet is now dangerously close to something he would have hated – the status of national treasure. Jarman In Pieces is a performance collage comprising original songs, film, interviews, ambient sounds and spoken word that aims to celebrate these contrasts rather than reconcile them. Our first film which like proud parents we still hold in high esteem. Shot in black and white super 8 Fickle was foisted onto an unsuspecting public at Morley College, London during 1994. In undertaking electronic music courses at the time we were invited to contribute an "electro-acoustic" composition for the "end of term" concert. Whilst those around us grappled with Baroque style arrangements, familiarised themselves with the intricacies of MIDIfying bass guitars, or used ancient synthesisers to provide passable impersonations of the BBC radiophonic workshop, we on the other hand decided to bring visuals into the equation. Thus Fickle was born embodying all that is transitory in our lives. It is a film very much in the tradition of Bunuel and Dali's "Un chien Andalou" and owes much also to "Meshes of the afternoon". The emotions of the central character, the androgenous engineer, are displayed within the various settings that he/she/it? finds itself. (The drudgery of walking up and down stairs as opposed to the adrenalin rush of a fairground joyride). The exploration of opposites such as the work/leisure, freedom/conformity, inside/outside, open/closed, up/down, choice/no choice dichotomies are discussed. Images ebb and flow with the music (a discarded wardrobe on a beach, oily globules of paint running down a canvas of confromity, television as deity and its subsequent execution), exploring the relationship between the individual and the surrounding internal and external architecture. It is a film embodying the maxim "as one door closes another one opens". One door leads to another, however some will always remain "doors of perception" leading to nothing but dead ends or vicious circles. We were approached to make a film to accompany Erik Satie's "Relache" opera/ballet for the 1995 Merton Arts Festival. After the successful screening of Fickle at the previous year's festival, what could be better we thought, than to make this sort of thing an annual event and finally put Merton on the celluloid map so to speak. The whole thing turned out to be a very bohemian affair, the event taking place at a venue called The Lantern Cafe (which in actual fact was a church), and the film being screened alongside a live performance of the piece by an orchestra. Satie was a rather eccentric figure by all accounts with a penchant for umbrellas and a collection of twelve identical grey suits among other things. We decided to include such elements of his personality into the film which ended up becoming a somewhat surreal biographical portrait of the man himself. In addition it borrowed heavily on the themes of artists such as Salvador Dali and Rene Magritte. Disaster almost struck on the day of the performance/screening when five minutes before we were due to "go on" there was a power cut rendering the whole of the Lantern Cafe in darkness. This was somewhat ironic bearing in mind that "Relache" roughly translated into English means "non performance"! It also threatened to add insult to injury in that we had already been forced to cancel a previous (and rather rare) live appearance on the opening day of the Festival due to rain! However, one replaced fuse later and it was on with the show, our celluloid Satie glaring garishly in all its super 8 glory across three monitor screens and providing a fitting accompaniment to a vibrant live orchestral rendition of the piece. In 2008 the Satie film was dusted down and digitally restored. It was screened at the Edinburgh Fringe Festival to the accompaniment of a new, original score as part of the Project Adorno/Steve Lake show, Tales From the Cutting Room Floor. 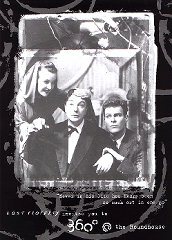 Despite commitments at the Edinburgh Fringe Festival we managed to complete our third short film in as many years for screening at the 1996 Merton Arts festival. This time we provided visuals to be run alongside Karlheinz Stockhausen's "Gesung der junglinge". Stockhausen may be justifiably regarded as one of the pioneers of electronic music and someone whom we've come to admire in the last few years. Stockhausen: Near and Far has a more sinister edge to it than the previous two and may best be described as an essay on mortality touching on themes of birth, the various stages of life through childhood to adulthood, and ultimately death. In amongst this we are asked to question the relationship between religion as state and suicide as individualism. The film was screened at Mitcham Parish Church (which had been previously touched by the hand of Anneka Rice of all people!) accompanying a four track recording which allowed the audience to hear the work as originally intended in quadraphonic surround sound. 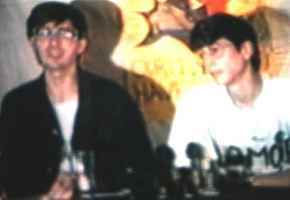 A collection of songs which turned into a film - a spoof biopic about the life and times of The Keynotes (who were to become Project Adorno). A period of intense creativity - the songs were diverse, colourful and shambolic! Notable memories: Trains at Waterloo East, the "No need to worry" theme tune - part Monkees, part Banana Splits, epic acoustic guitar recording session for "Memories of now", "band rehearsals" at a local church hall which we filled with dry ice for filming; the spoof "press conference" and of course cut away shots of SM in the "mixing booth" - we laughed 'til we cried. An audio visual celebration of twentieth century European culture, art and music is being staged by a brother and sister [sic] at Merton Civic Centre. Keynotes are performing the multi-media show on April 8 under the title Chunnel Vision. Entry is free and pieces will be performed at regular intervals throughout the day starting at noon. Anyone interested in performance art, the avant garde and the use of new techonolgy in sound and vision is invited. 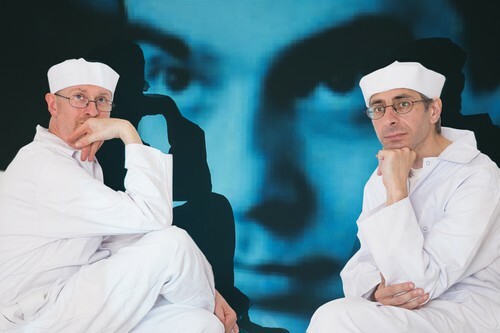 Chunnel Vision was briefly resurrected the following year as part of Project Adorno's 1996 Edinburgh Fringe show, Millennium Suite, although technical glitches prevented it from being fully realised. In 2002 the Chunnel Vision piece was revisited and re-worked to include elements of spoken word performance poetry. It was performed at Artspace, an art show taking place in a terraced house in North London. One day we vow to return to Chunnel Vision and perform it as it appears & sounds in our heads. In which Project Adorno found themselves scampering round London via the tube. The brief was to visit 26 stations going from A-Z writing songs about each place visited. 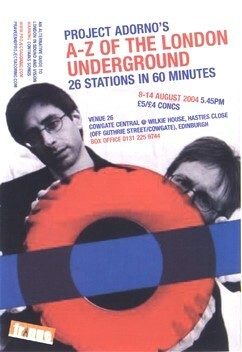 The songs were performed at the Edinburgh Fringe in 2004 accompanied by a Power Point presentation featuring photos taken during the whole escapade. In many ways the journey took on a life of its own... A number of videos (courtesy of TubeDragon1) have since sprung up on You Tube to accompany some of the songs and one creative individual (the Underground Masker) has even done a cover of our "Goodge Street Shuffle" song! We are flattered, and thank you all. Satie - a re-working of the super8 film originally produced in 1995 with a new, original sound-score. Best described as an abstract biopic on the life and work of Erik Satie, featuring filmic images shot in gaudy, Jarman-esque super-8 welded to a lively sound-collage mixing song, spoken word, found-sound and electro-rhythms. Ministry of the Mundane - a short film in the vein of Patrick Keiller's "London/Robinson in Space" series. With a nod to Gilbert & George it is a tale of Kafka-esque beaurocratisation putting the "Eighties" into "1984" with an Orwellian take on news, views & (dis)information all accompanied by a pre i-pod soundtrack that is entirely their own.